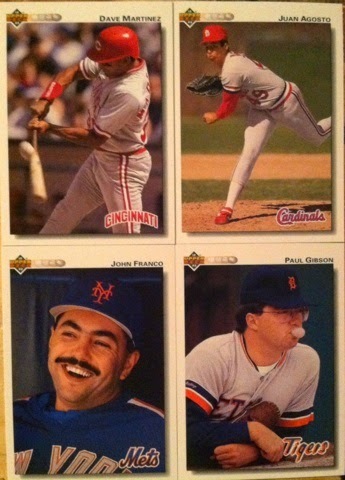 I remember a time when Upper Deck ruled the baseball card world! Their action packed photography and innovation put rival companies to shame. 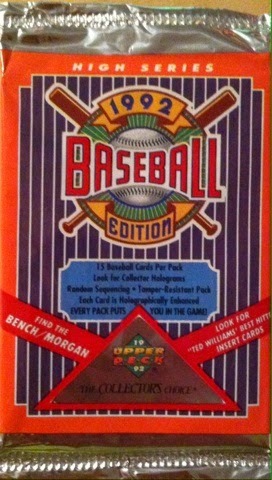 In every pack of 1992 Upper Deck High Series baseball is 15 cards. Every pack would roughly run you about $1 now-a-days. 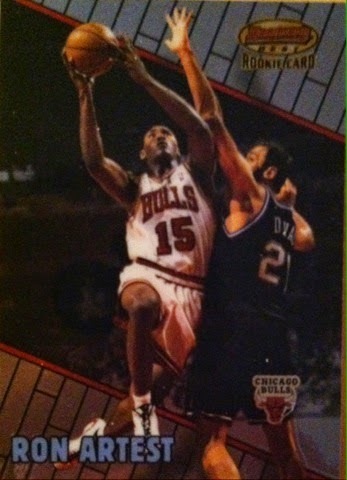 The base cards had a slight border on the outside with a thicker part up on top that had the players name. The photography used was mainly player focused. Not usually something Upper Deck was known for. By player focused, I mean the photography was basically aimed around the main player. Usually Upper Deck has action packed photography. Glad to see some good players make it in my pack. 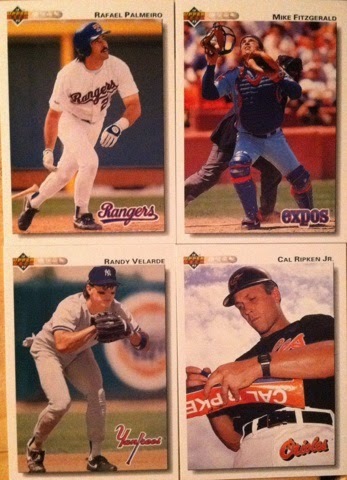 Ripken being the best and one I didn't have yet. 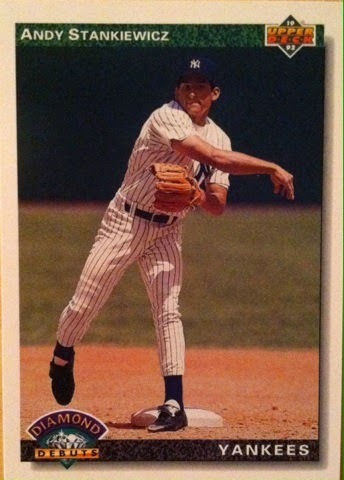 And the final card in the pack was a Diamond Debut which also happens to be a Yankee PC need. Overall, not too shabby. Added a couple of Yankees, pulled a few bigger names and added a new Ripken. Sometimes it's the little things that are enough in this hobby. Especially if you are a true collector..
You wanted another edition of Breakin Wax, well you got it. 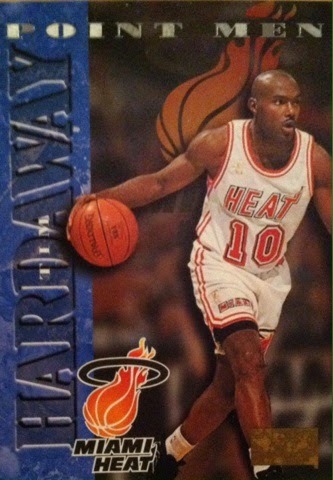 Especially if you are a fan of basketball cards. 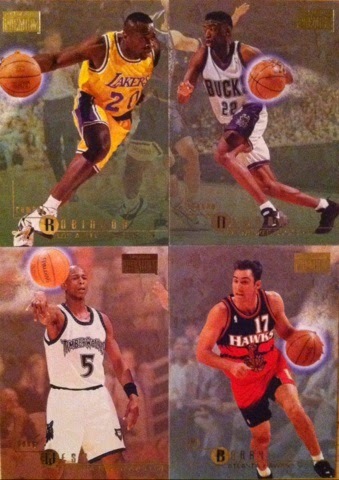 In each pack of 1999-2000 Topps basketball cards is 11 cards. These cards are a mix of veterans and rookies. Speaking of rookies, this was the year of some great ones such as Jason Terry, Ron Artest, Elton Brand, Baron Davis, and Lamar Odom among many others. Packs can be found relatively cheap. I will say right off, I hated this border color. It was so ugly and bright. 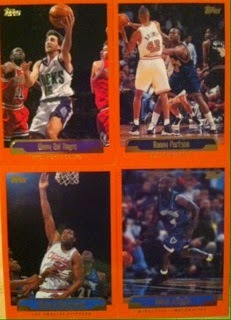 I am not quite sure if Topps was trying to mock a basketball or what, but to me it looks like they are in orange jello or something. At least the photography is still nice. 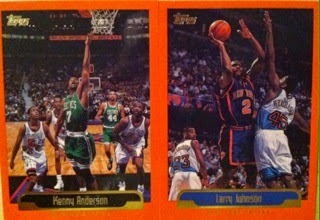 I was always a big fan of Larry Johnson so I was pretty stoked to had found him in my pack. And a nice insert pull to top it off! Hakeeeeeeeeeemmm Olajuwon! These inserts fell at 1:12 odds. 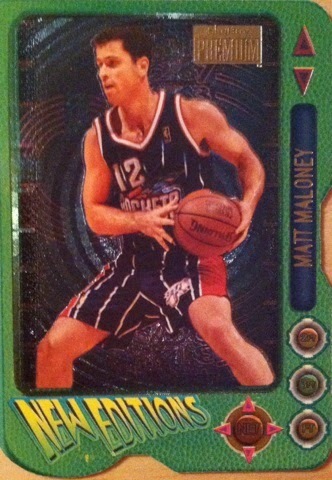 I seem to be having some great luck recently with late 90's Topps basketball. Overall, no rookies again, but an insert was pulled so that made me happy. With my recent luck maybe I should go back and try a few of these over again. You just never know what you may pull or which player will show up. Most importantly, the fun you can have. 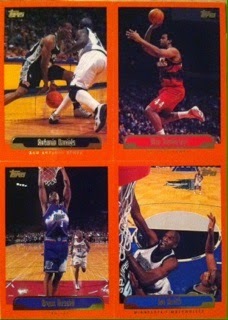 In this edition of Breakin Wax, I am busting a pack of one of my favorite late 90's products, Skybox Premium. Just like some other posts I have done in this series, I must apologize that the pack wrapper didn't get included in this post. But, I promise I will do a breakdown none-the-less. 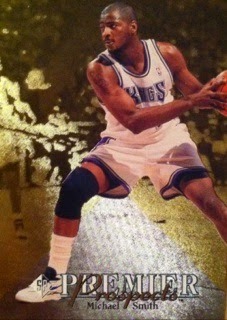 In every pack of Skybox Premium basketball, there are 10 cards and a $3 per pack price tag. In there will be a mix of veterans, rookies and subsets. Of course the occasional fun insert and if you are really lucky, a ruby parallel. 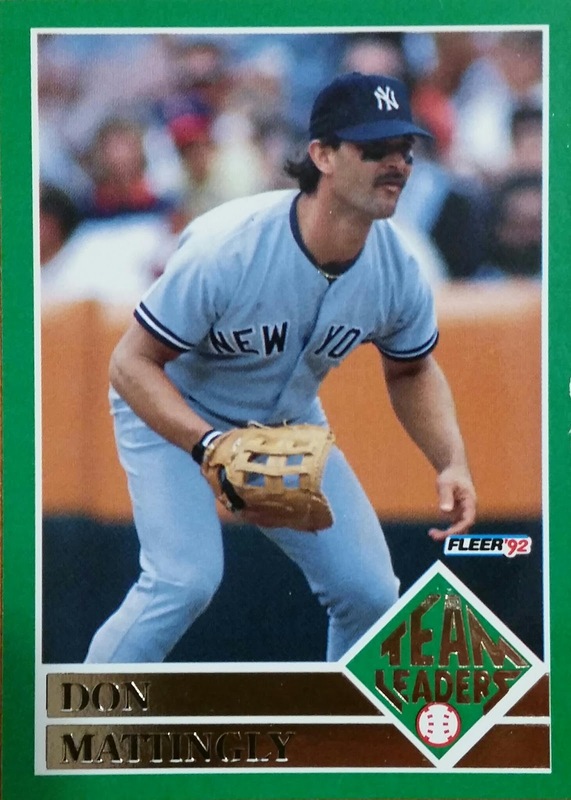 The base cards had color faded backgrounds with full color player standing out in the forefront. Looked pretty cool, especially in person. Subset, Point Men. I can remember how many times my Knicks got taken down by this guy. You can get into Double Trouble with these subsets. 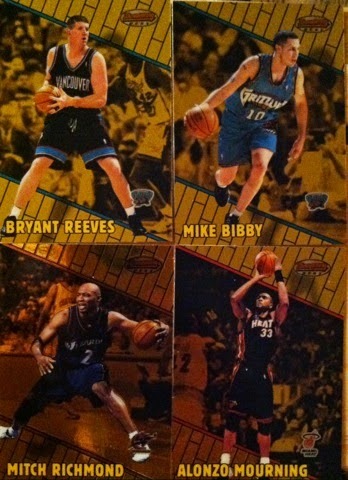 Rookie cards! Full of color. 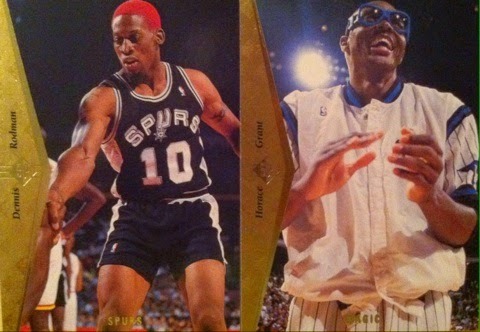 I figured these would be the two players I would get in my pack, I pulled them a lot in the 90's. and to my surprise, a 1:12 insert find called New Editions. Pretty cool design if you ask me. Overall, two rookies and an insert make this worth opening. I am very tempted to go back and try another. 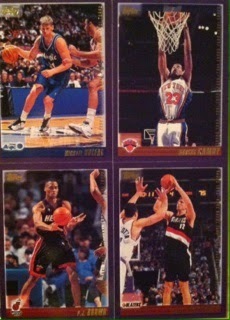 Do you collect sports/trading cards? Do you have a list of cards you have been wanting to acquire but don't have a place to put it or list it for other collectors to help you with? Well, I hopefully have solved your problem! I have created THE TRADING CARD WANT LIST. A place where you can go and list your want lists in an easy year by year format. Whether you collect sports or non sports it doesn't matter, the Trading Card Want List is open for any type of card collector. Just read these RULES before joining in on the fun! As a bonus on The Trading Card Want List, I have placed tabs at the top where I am just giving cards away randomly. There is no contest entry needed just easy to follow steps to claim them that you can find HERE. The biggest point of The Trading Card Want List is to bring all of us collectors together to help one another. This is as I have always said, #ONEHOBBY. Collecting cards is a whole lot more fun when you can share the fun. 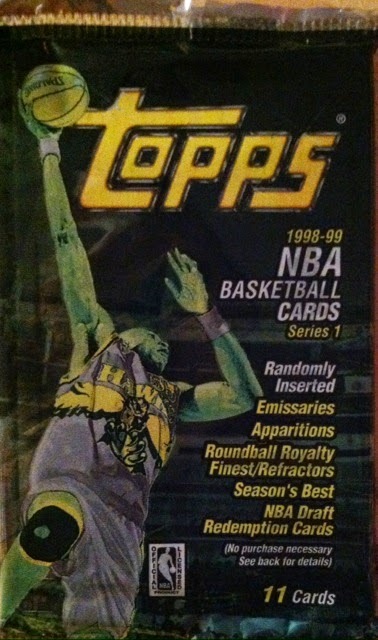 I hope all of you who read this check out The Trading Card Want List. I also hope you add it to your Blog List, Follow it, and just join in on the fun and share it with others. I want this to grow into something fun and useful. 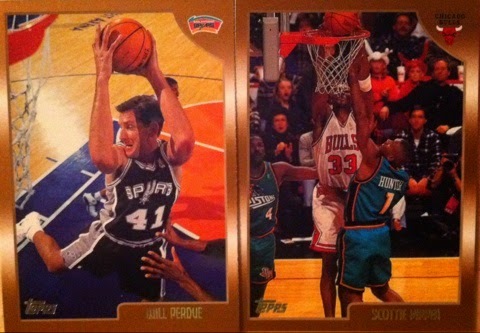 In this recent edition of Breakin Wax, I am breaking a pack of 2000-2001 Topps basketball. 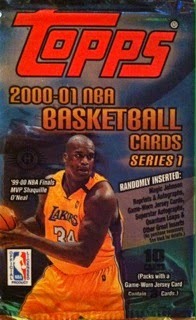 In every pack of 2000-2001 Topps Basketball Series 1 comes 11 cards. There is a mix of rookie and veterans in each pack. Key rookies for this year is Kenyon Martin and Jamal Crawford. The base cards are pretty clean and despite the border, I like the layout of the cards. The design of the border leaves open a really nice space for action photography which Topps definitely filled it in. One of my favorite pics is this Camby dunk photo and not just because he was a Knick. Sweet lookin Hidden Gem insert! 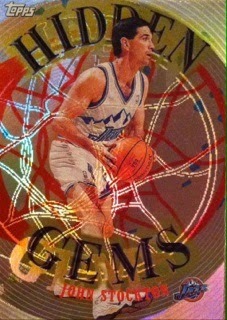 I like the bright rainbow foil outlining what appears to be a net/basketball. These fell at 1:12 odds! 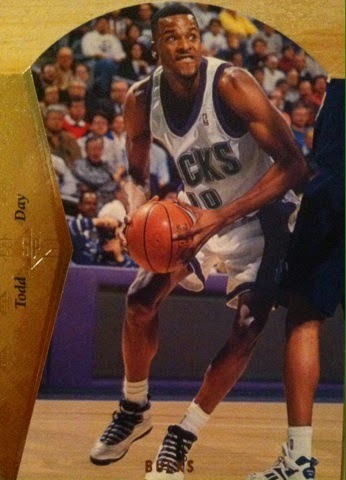 And it was of one of my favorite players from the 90's so was a double bonus! Overall, a nice break. 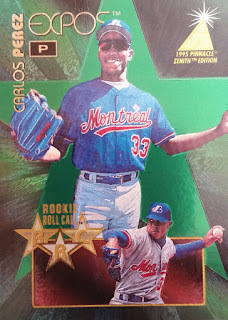 Anytime you can pull an insert from the 90's there is cause for celebration and makes the pack worth opening. Bowman's Best to me was Chrome's cousin. It had all of the makings of Chrome, but yet still wasn't chrome. I am sorry about lack of pack picture, but I promise if I find one I will add at a later date. Either way, here is a breakdown of a pack. In each pack of 1999-2000 Bowman's Best is 6 cards. You get roughly 5 vets and 1 rookie per pack. Packs roughly go for about $5 each now. This product is still very popular. The design as I stated above, was similar to Chrome both in design and feel. 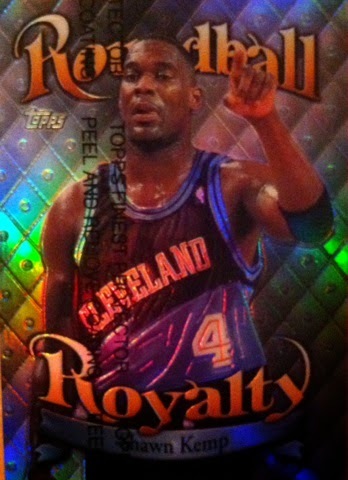 There were also refractor parallels to find that look amazing with this design. If you don't believe me or want to see one, go eBay look up one. Overall, an okay break. I would have liked to had pulled an refractor but you can't always get what you want. That's why the chase is so much fun. 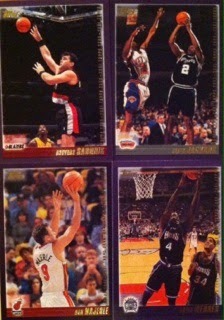 Topps basketball in the 90's was fun and produced some memorable and valuable inserts later in the 90's. Especially when you landed Jordan. I wanted to rip a pack to see if I could beat the odds and pull one. Well, I did beat the odds but it wasn't Jordan. However, it was still pretty stinkin cool! 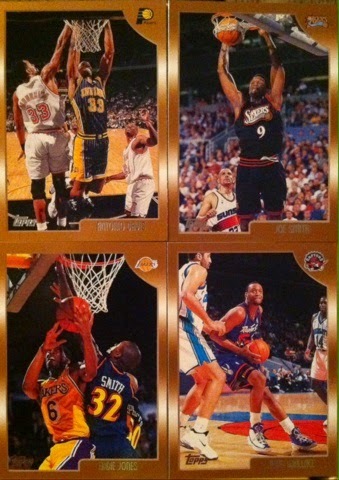 In each pack of 1998-1999 Topps Basketball Series 1 is 11 cards. The 11 cards are a mix of rookies and veterans and packs now-a-days can be found pretty cheap. 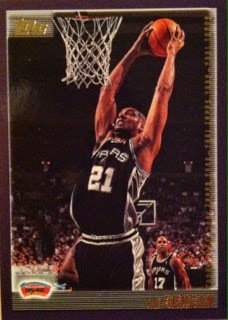 Key rookies in the product is Paul Pierce, Dirk and Vince Carter. The base card design was pretty border heavy so I wasn't a complete fan. The border color wasn't the greatest either but I would say it does look better than the usual white. However, I did enjoy the photography on these. These look like candidates for Caption This! AND THE BIG BOOM! 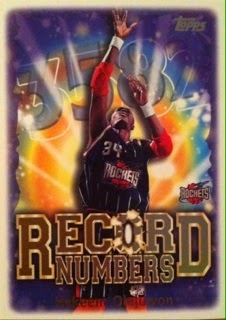 A Roundball "Finest" REFRACTOR!! These fell 1:144!! Was an excellent pull! The only thing that would have topped it would have been an MJ version. Overall, this pack was the bomb! How can you beat such a great pull. I was more than beyond happy. 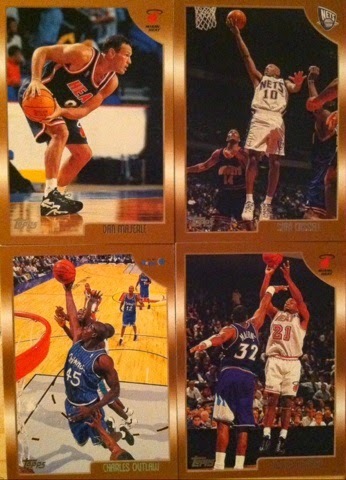 This insert pull alone shows you why I loved collecting in the 90's so much. They don't make pulls in this era of collecting that makes you feel like this one did to me. I will forever remember opening this pack. 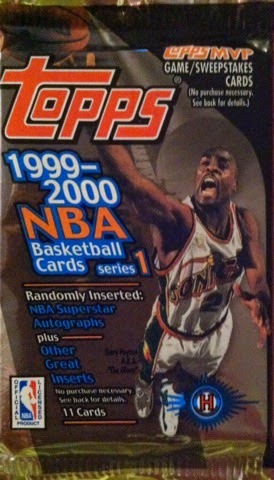 While I am at it, for those of you who busted and collected packs in the 90's, what was your greatest pull? 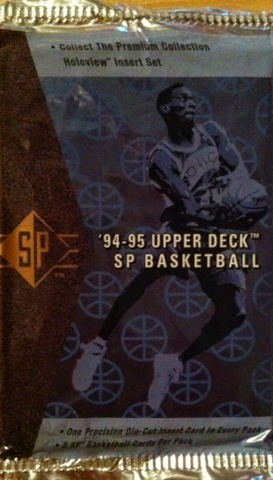 Still to this day very popular, Sp (now Sp Authentic), brought excitement to 90's rippers. Having been one of those rippers, I wanted to revisit what once was. Here we go! 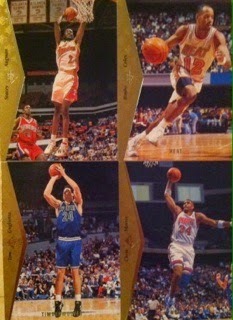 In every pack of 1994-1995 Sp basketball is 8 cards with one of those cards being a die cut. Packs run around $3. The base cards looked really nice. An elegant gold triangle down the left side of the blog with the player's name leaving the card open for some nice action photography. 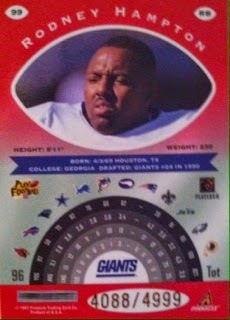 The only thing I would have fixed is the placement of the team name which blends into the bottom of the card. Two cards that could be featured in my Caption This card segment. If you want to jump on these ahead of time, feel free to in comments. 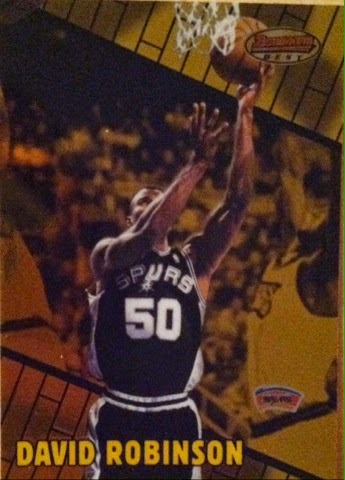 My die cut card from the pack. You can't ever go wrong with a die cut. And my rookie from the pack. Michael Smith. 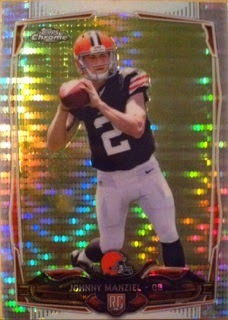 These look really cool in person with the foil background and the player in the forefront. 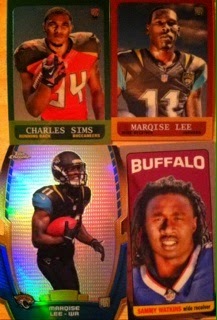 Overall, nothing too huge, but a few good players, a die cut and a rookie. So not a bad break in my terms. Might be something I give another go with. 1997. The year when a lot of cool, unique, fun and TOTALLY awesome products released. So what were the odds I would go and find one of my favorites from that year, well, very high. 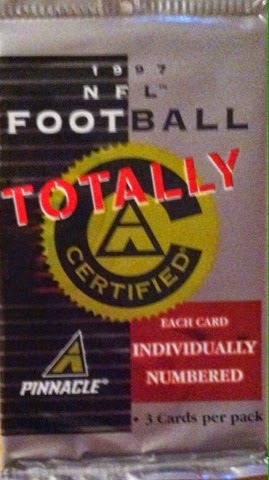 So I am proud to announce today's breaking wax is 1997 Totally Certified football! 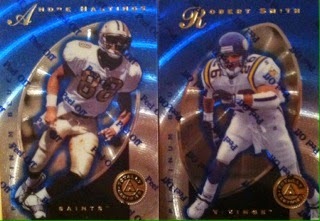 In every pack of 1997 Totally Certified football is 3 cards. I found these packs for roughly $4 each which is a great deal for what you can get from these. The base card design is full of etched awesomeness! They are also a little bit thicker than most base and with all the etching some of the cards have a slight bend to them like with Chrome. The base cards are even more beatufiul in person and like with a lot of things I take pictures of on here, the pictures never do it justice. There are three levels of Platinum base cards to collect in Red (2 per pack), Blue (1 per pack) and Gold (only 30 of each card). Each base card also has a protective peel off sticker which I leave on. It adds a fun effect. Each Platinum Red base card is numbered to 4999. 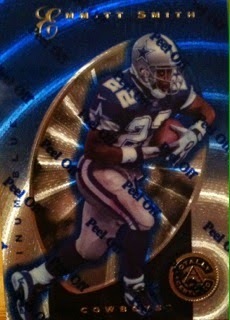 Each Platinum Blue base card is numbered to 2499 and I pulled a pretty nice one in Emmitt. Still hold a $24 BV! Overall, a great break. 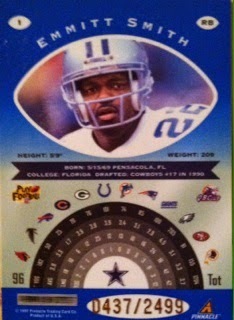 Especially the Platinum Blue pull of Emmitt. I think there is a lot going for this product. All of the cards are numbered, the Platinum Golds are still sought after, and it's simply beautiful. If you haven't ever seen one up close, please go to find a way to pick up a single from your favorite team or player. I promise you won't regret it. 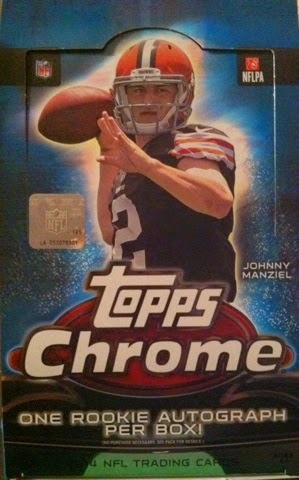 Each box of 2014 Topps Chrome football comes with 24 packs per box with 4 cards per pack. Prices for boxes have dropped but I bought mine when they were going for $70. Wished I had waited. Most now go for $50 or under. I didn't bother posting a veteran base card since the rookies match it. I figure they would give you enough of an idea. 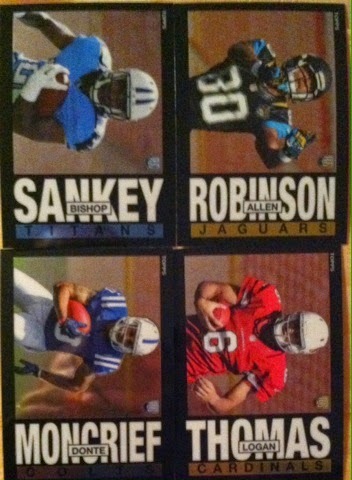 Pulled some great rookie cards of Watkins, Adams, Sankey, Carr, Clowney and Bridgewater among others. 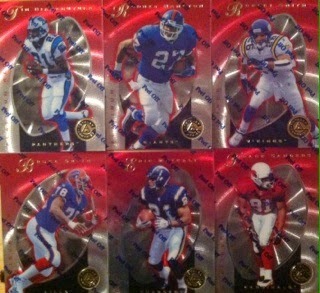 I wished Odell was found but this box lacked him and so does my collection still. 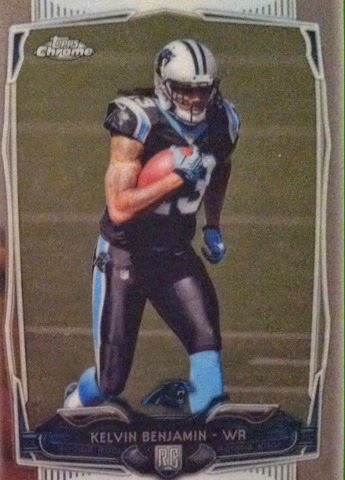 I did however managed to pull an Sp photo variation of Kelvin Benjamin. Looks like these are not at all easy pulls especially the rookie ones. 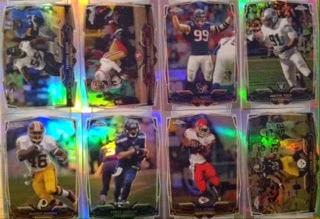 Refractors!! 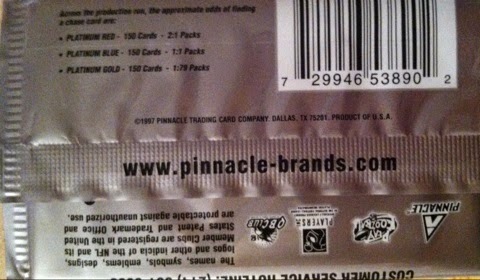 Other than rookie cards, these are the main reason I love this product! Some colored ones. Only two numbered ones in the pink and camo. I was a bit disappointed by the lack of color in this box. 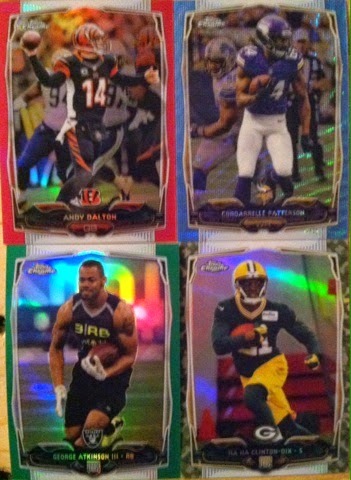 Only four colored parallel refractors! 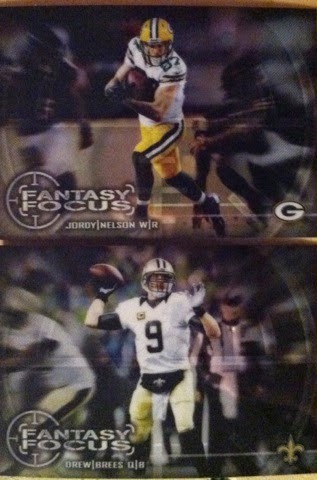 Fantasy Focus that falls 1:12 packs. These look so much better chromed than they did in the flagship. 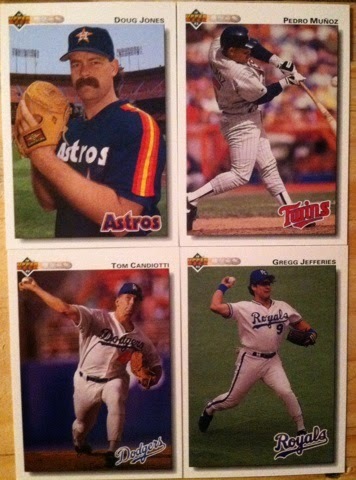 1985 Topps, once again, look better chromed fall 1:6 packs. 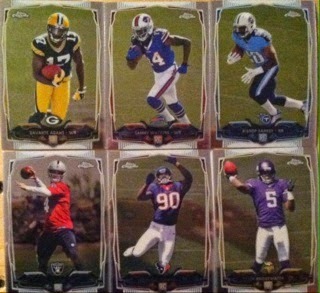 1963 Topps mini's 1:12, 1965 Topps football 1:24 and Chrome Rookie die cuts that fall 1:24. So this box was pretty spot on with the odds. Pulsar!! Johnny! One per hobby box. Pulled this when he still mattered lol. Overall, I don't think my box was horrible. I was a bit disappointed with the lack of colored refractors, not getting an Odell rookie (something that isn't Topps fault), and my autograph pull only because it was a redemption. I wished they could add an extra autograph and have two per box like baseball then my break may have been a bit more exciting. I also wished I had waited for the price to drop like it has. At the $70 I question return value on this break, but not at the $50. I think right now is the time to eat this stuff up with this class before this product explodes and is untouchable. One, Two, Three...Wait New But Not New To Me? Can You Say eBay Steal? I wANNA Build A Rainbow! GOUDEY GOUDEY! A Pay-It-Foward Mail Day! Box Toppers....SIGNED, unsealed and delivered!